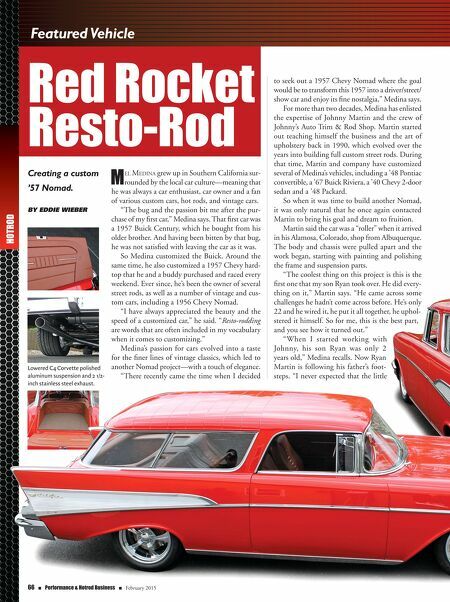 66 n Performance & Hotrod Business n February 2015 Red Rocket Resto-Rod M el Medina grew up in Southern California sur- rounded by the local car culture—meaning that he was always a car enthusiast, car owner and a fan of various custom cars, hot rods, and vintage cars. "The bug and the passion bit me after the pur- chase of my first car," Medina says. That first car was a 1957 Buick Century, which he bought from his older brother. And having been bitten by that bug, he was not satisfied with leaving the car as it was. So Medina customized the Buick. Around the same time, he also customized a 1957 Chevy hard- top that he and a buddy purchased and raced every weekend. Ever since, he's been the owner of several street rods, as well as a number of vintage and cus- tom cars, including a 1956 Chevy Nomad. "I have always appreciated the beauty and the speed of a customized car," he said. "Resto-rodding are words that are often included in my vocabulary when it comes to customizing." Medina's passion for cars evolved into a taste for the finer lines of vintage classics, which led to another Nomad project—with a touch of elegance. 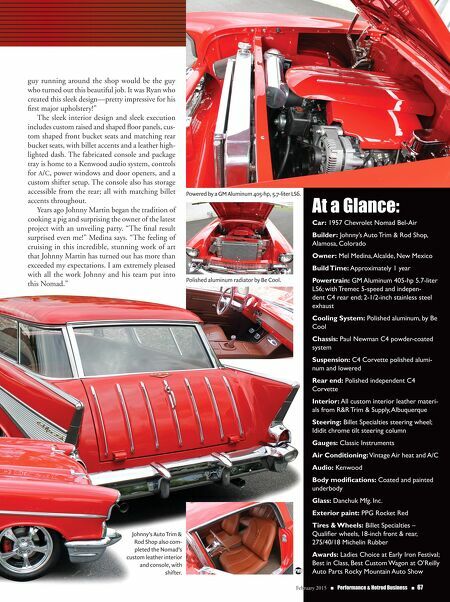 "There recently came the time when I decided Creating a custom '57 Nomad. By EddiE WiEBEr to seek out a 1957 Chevy Nomad where the goal would be to transform this 1957 into a driver/street/ show car and enjoy its fine nostalgia," Medina says. For more than two decades, Medina has enlisted the expertise of Johnny Martin and the crew of Johnny's Auto Trim & Rod Shop. Martin started out teaching himself the business and the art of upholstery back in 1990, which evolved over the years into building full custom street rods. During that time, Martin and company have customized several of Medina's vehicles, including a '48 Pontiac convertible, a '67 Buick Riviera, a '40 Chevy 2-door sedan and a '48 Packard. So when it was time to build another Nomad, it was only natural that he once again contacted Martin to bring his goal and dream to fruition. Martin said the car was a "roller" when it arrived in his Alamosa, Colorado, shop from Albuquerque. The body and chassis were pulled apart and the work began, starting with painting and polishing the frame and suspension parts. "The coolest thing on this project is this is the first one that my son Ryan took over. He did every- thing on it," Martin says. "He came across some challenges he hadn't come across before. He's only 22 and he wired it, he put it all together, he uphol- stered it himself. So for me, this is the best part, and you see how it turned out." "When I started working with Johnny, his son Ryan was only 2 years old," Medina recalls. Now Ryan Martin is following his father's foot- steps. "I never expected that the little HOTROD Featured Vehicle Lowered C4 Corvette polished aluminum suspension and 2 1/2- inch stainless steel exhaust.